During WWII, scientists in Switzerland were charged with the task of finding more effective treatments for burn victims. Their great discovery? Panthenol, the pro-vitamin of vitamin B5 which helped treating burns. Inspired by panthenol, Pantene, owned by Swiss drug company Hoffman-LaRoche, makes its debut as a premium hair care line across Europe in 1947, replete with glass bottles and prestige scents. 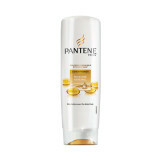 After years of extensive research and development, Pantene launches its most comprehensive and groundbreaking offering in 2012—customized solutions all based on hair structure. If you know the hair you have, Pantene will give you the hair you want. 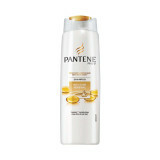 Pantene products can be found in Clicks stores in South Africa, Namibia and Botswana. Intensively smoothes hair for lasting softness in just two minutes. A rich intensive smoothening treatment with micro-smoothers works with your hair's structure to lock out humidity to help keep frizz from forming, leaving your hair satin-like smooth. The Repair & Protect collection helps to restore hair's strength, protect against future styling damage and prevent the formation of split ends. It also helps protect against styling damage.